Add rice flour, carom seeds, sesame seeds, butter and a few tsp of cold water to a mixing bowl and mix well. Use the star nozzle in the murukku press. 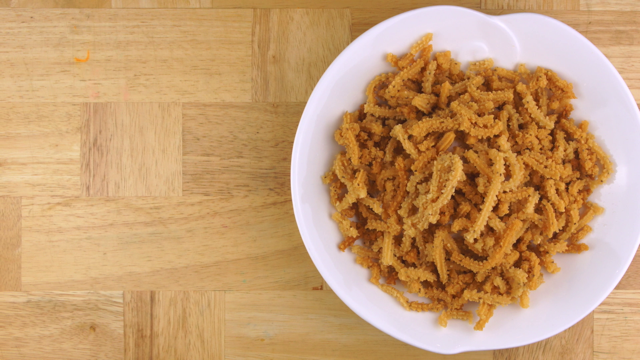 Fill the press with the dough and press it on to a plate as spirals. Slightly press the open end towards the inner layer. Repeat it for the rest of the dough. If the dough is not coming out smoothly, adjust the quantity of water. Using the murukku press, press out the dough and place it in a spiral manner on a plastic bag or in a flat spatula. Heat oil in a pan and gently transfer the murukku to the hot oil. Place it on a plate covered with paper towel or on a sieve to let the excess oil come out. Reserve some murukku mixture in case the dough gets sticky, you can add the powder to make it smooth. Make sure to mix the butter into the flour mixture then add the water. Always test out a small sample on the fire (medium heat), then start frying the remaining batches. Do not let the dough set for too long. Quickly start doing the batches.